Western blot analysis of extracts from COS-7 and HeLa cells using VDAC (D73D12) Rabbit mAb (HRP Conjugate). 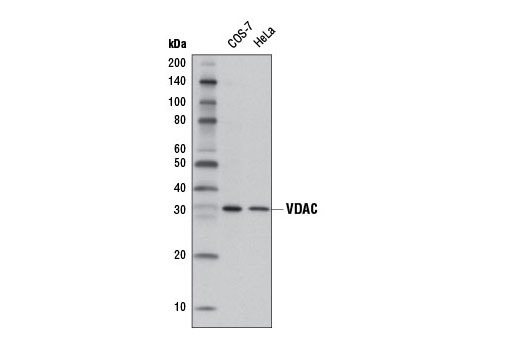 VDAC (D73D12) Rabbit mAb (HRP Conjugate) detects endogenous levels of total VDAC protein. Monoclonal antibody is produced by immunizing animals with a synthetic peptide corresponding to the amino terminus of human VDAC-1 protein. Voltage-dependent anion channel (VDAC), ubiquitously expressed and located in the outer mitochondrial membrane, is generally thought to be the primary means by which metabolites diffuse in and out of the mitochondria (1). In addition, this channel plays a role in apoptotic signaling. The change in mitochondrial permeability characteristic of apoptosis is mediated by Bcl-2 family proteins, which bind to VDAC, altering the channel kinetics (2). Homodimerization of VDAC may be a mechanism for changing mitochondrial permeability and supporting release of cytochrome c (3). In mammalian cells, there are three VDAC isoforms, VDAC1, which is the most widely expressed isoform, as well as VDAC2 and VDAC3 (4,5). Hodge, T. and Colombini, M. (1997) J Membr Biol 157, 271-9. Shimizu, S. et al. (1999) Nature 399, 483-7. Zheng, Y. et al. (2004) Oncogene 23, 1239-47. Craigen, W.J. and Graham, B.H. (2008) J Bioenerg Biomembr 40, 207-12. Yamamoto, T. et al. (2006) J Proteome Res 5, 3336-44.